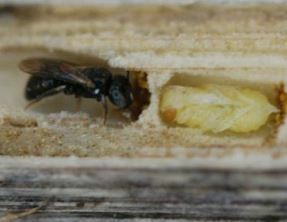 While global warming threatens the future of agriculture and ecosystems, scientists have discovered one of Australia’s common native bees is in fact thriving following the last Ice Age. Flinders University researcher Rebecca Dew from Flinders School of Biological Sciences. Flinders Biological Sciences PhD student Rebecca Dew and Associate Professor Michael Schwarz, together with Professor Sandra Rehan of the University of New Hampshire in the US, have found a rapid increase in the population size of the small carpenter bee (Ceratina australensis) from 18,000 years ago, when the climate began warming up after the last Ice Age. In another recent collaborative study between the Flinders School of Biological Sciences team, previous Flinders research students Dr Scott Groom and Ms Carmen da Silva, Dr Daniel Silva from Brazil and Associate Professor Mark Stevens, from the South Australian Museum, showed that a bee species accidentally introduced to Fiji has become widespread and will flourish with continued global warming, perhaps even spreading to Australia and New Zealand. Small carpenter bee. Photo courtesy Sandra Rehan, University of New Hampshire.